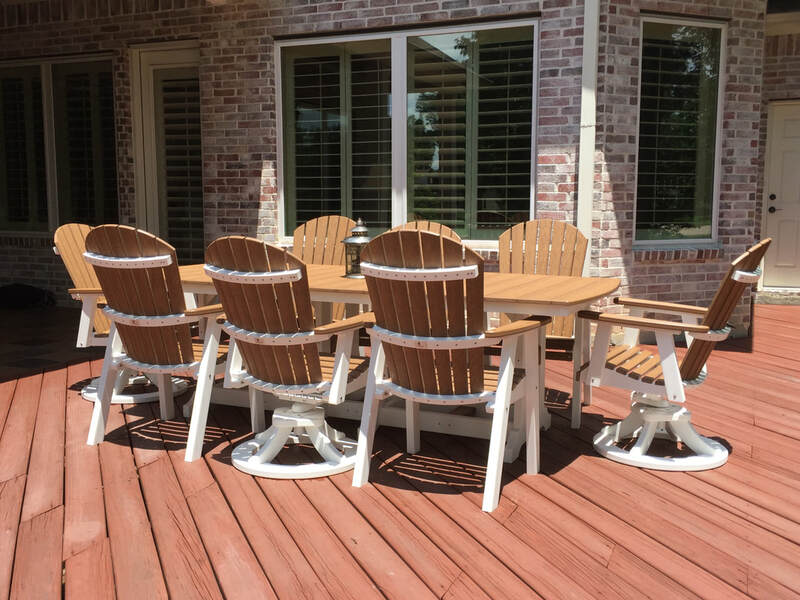 Magnolia Outdoor Living is happy to serve the area within 30 miles of Pinehurst and Lake Conroe with fully assembled and delivered to your deck, porch, patio, pool, etc. If you live outside our delivery area, we will be pleased to ship your selection directly to your door. Your Berlin Gardens furniture will arrive in a box with directions on how to assemble it. You are also welcome to call us for more advice on assembling or any other questions, 817-688-4018. 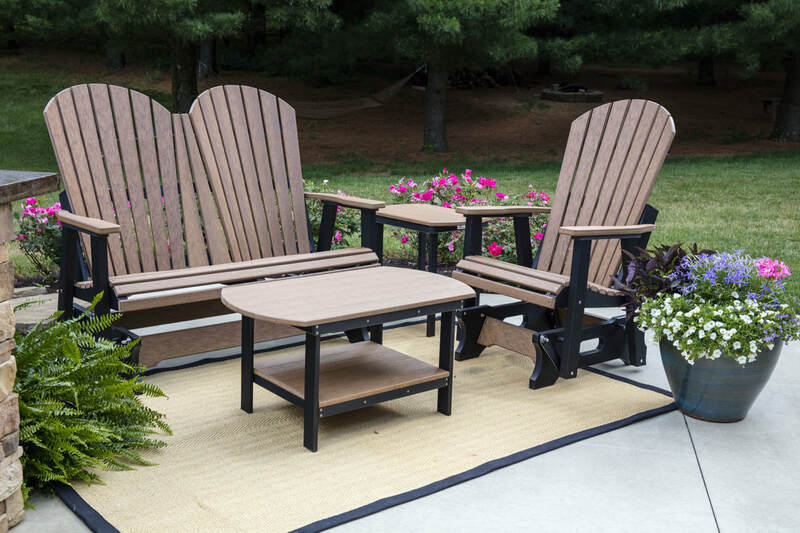 These Amish made Adirondacks are so comfortable and easy to get out of. The color is mixed into the lumber during creation from recycled milk jugs, called polyethylene . Choose from a rainbow of juicy bright colors or an array of beautifully subdued earth tone to enhance your outdoor living areas in style. Assembled and delivered within 30 mile radius option is $440. The Direct to you option (you receive it in a box, some assembly is required) $402. Adirondacks are great to relax in. We offer fully-assembled, delivered and set up on you deck, porch, patio, pool, balcony, etc. 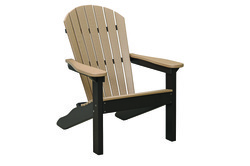 within a 30 mile radius of our Pinehurst and Lake Conroe stores $440 for the Adirondack chair and $177 for the Adirondack footstool or choose the direct-to-you option where your choice comes to you in a box by UPS or similar delivery truck and you assemble it $402 for the Adirondack chair and $167 for the Adirondack footstool. Regular Dining, counter, and bar heights, XT bar with 30"seat height. All 31 standard colors are available in all chairs. New natural finish colors are also available for all chairs. Shown below to the right is a dining height chair that swivels and rocks as well as stationary chairs in comfo back antique mahogany on white, a textured finish color! We have a large selection available for immediate pickup or delivery! 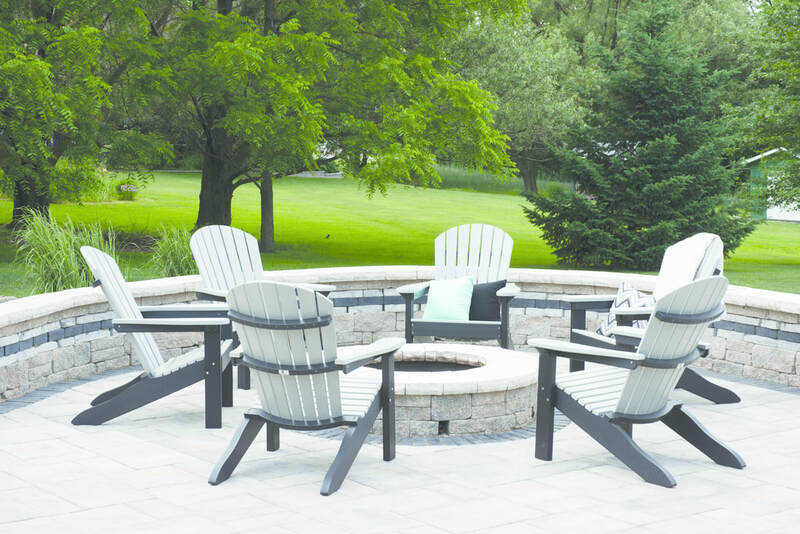 Adirondack is a style of chair that is great for lounging, reading, and gathering for fun and fellowship, friendship; whether you are around a fire pit, at the pool or beach or just relaxing under your favorite shade tree. Prices for standard smooth colors; textured colors add 10%. Add 10% if you prefer one of our natural finish colors, the 3 colors and their two-tone options that have texture to them for the look and feel of wood; however, none of the issues of real wood, like splinters or refinishing/repainting needs. If your selection is not in stock, it only takes about 3 weeks to receive it. We are able to ship direct to you, everywhere in the United States, free! Dining, counter, bar heights and XT extra tall bar. 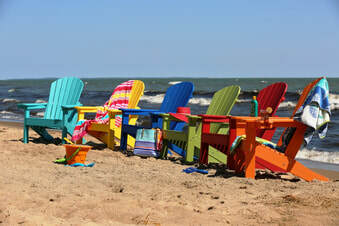 All colors are available in all chairs. Shown here are bar height chairs that swivel! dining, counter and bar, and XT bar 30" seat. We are happy to sell Berlin Gardens fully assembled, delivered and set up on your location or we will have it shipped directly to you if you prefer or if you live far from our Pinehurst or Lake Conroe stores. Using recycled materials never felt so good. Each chair allows about 500 milk jugs to be recycled. The furniture is heavy, won't rot, warp, crack, splinter, fade or support bacterial growth. It is backed by a 20 year warranty. Counter height chairs are effortless to get in and out of. 46" high x 28 wide x 31" deep. Deck chairs are a little roomier in the seat and taller in the back. Available in all color choices. 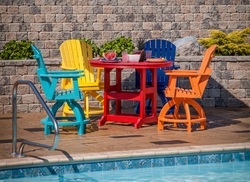 $459 assembled, delivered and set up on your porch, patio, deck, pool, balcony, etc. in our Pinehurst area. Or save a little and assemble it yourself $415, if you choose that option or do not live near Pinehurst or Conroe Texas. Bar height is designed to allow you to view your scenery without obstruction such as a rail. 51" high x 28" wide x 31" deep. 5 inches higher than the counter height. 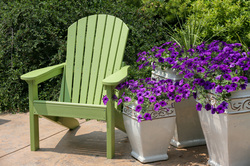 $544 fully assembled and delivered to your porch (or desired spot) within our 30 mile radius if you choose that option. ​Delivered in a box as a kit to your door $492. Comfortable contour back and seat for your rocking pleasure. Choose the style of back. The style that has height to it like a crown is called "cozi back". Shown here in chocolate on Black. left is called "comfo back". Shown in weatherwood on black. 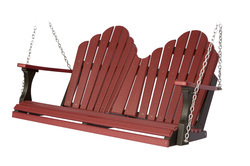 Swings are available in all color choices with your choice of Zinc chains or stainless steel chains. We also have Arbors and A-frames. Double Comfo or Cozi back swing with zinc chains $721 fully assembled and hung on your hooks in the 30 mile area to our Pinehurst or our Lake Conroe store. Or receive it as a kit in a box $661. Double Comfo or Cozi back swing with stainless steel chains $825 fully assembled and hung on your hooks in the 30 mile area to our Pinehurst or Lake Conroe stores. Or receive it as a kit in a box $765. $488 assembled or $443 in a box in the natural finish/textured colors.